Having now lived in our motorhome for over 6 years, and during that time almost constantly tweaked and tuned the electrical system, we feel that we have got it pretty much right. So what makes a good electrical system in a motorhome? The answer to this question, not surprisingly is … “it depends”. Everybody has different power requirements and different usage patterns. Listed below are a series of general tips, hints and observations that I hope you will find useful. These comments are aimed mainly at people who wish to live “off-the-grid” … not plugged into a caravan park power supply. Make sure that the house battery system is 100% isolated from the crank battery system. The two battery systems have different purposes and differing charging requirements. If your vehicle is 24volt – have as much as possible running on 24 volt. You will need a 24v to 12v converter to run some things from 12v, try to keep these devices to a minimum. If your vehicle is 12 volt, make sure that as many appliances as possible run on the native 12 volts. If your vehicle has a 24 volt crank system – make sure your house system is 24 volts too. Do not install 240v lights. Inverters are at best 90% efficient (often less than 60% at low loads) – this means that at least 10% extra energy is being wasted by the inverter. Make sure you can quickly charge the batteries from the engine alternator. There is no point in running a 300HP engine for hours to get to where you are going, then have to run a generator to charge the house batteries when you stop. Carefully calculate your average daily power usage. This is best done with a spreadsheet . Add 10% – 20% to the total (Peukert’s Law). This is the amount of energy that you will need to put back into the batteries each day. If you have a large battery bank, you will be able to survive for a longer time without putting all of this energy back … however, you will still have to put it back at some stage. The amount of energy gained from a given wattage of solar panels varies considerably throughout the year and around the country. This makes it difficult to calculate the number of solar panels required to meet the energy needs for people that travel all over the country. You should aim to meet about 90% – 95% of your year round energy needs. For the remaining 5% – 10% a generator will be required. Wind turbines are even worse – it is almost impossible for a traveller to calculate how much energy can be gained from wind power. Run the correct sized cable – no point spending $3000 on solar panels and saving $30 by installing undersized cable that seriously reduces the output of the panels. Put fuses and/or circuit breakers on EVERYTHING. Fuses protect against electrical fires. If an appliance runs at 5 amps, it’s connecting cable must be rated to carry that 5 amps and the cable must be protected by an appropriate sized fuse. Australian standards require fuses in BOTH the positive and negative conductors for each load. You need some reliable method of calculating how much usable energy remains in your battery bank. With the exception of the extreme ends of the scale, battery voltage is NOT a good indicator of remaining battery capacity. Let me repeat that … you can not tell how much usable energy remains in your battery bank using a volt meter! A correctly configured PL40 can tell you – a properly installed and configured Xantrex battery monitor will tell you… a volt meter will not! Use power when you have excess, conserve when you have a shortage. We start the breadmaker once the batteries are getting close to fully charged. We start the clothes washing machine when the batteries are full etc. Undertake tasks that use a lot of power just before you are about to travel – the alternator will recharge the batteries as you travel. Use a 12/24 volt refridgerator – normal household fridges use 30% – 60% more power. I know that Danfoss compressor fridges are expencive – erecting additional solar panels to allow you to run a household fridge is more expencive. Use gas for large heating loads. Electrically heating water (either in an electric kettle or electric water heater) is not practical unless you run a generator. It is far more economical to cook with gas rather than erect enough solar panels to run an electric cooker. If you must run a generator, make sure it is doing as much work as it can while it is running. The first watt generated costs the most. For this reason you should get the largest battery changer you can afford. eg – a 20amp battery charger running from a generator may consume 1 litre per hour – a 60amp charger running on the same generator will consume perhaps 1.2 litres per hour. That extra 40 amps is only costing 20% of the first 20 amps. Once parked up at a beach or bush camp, we almost never have to run a generator. We manage very well on wind and solar power. We really enjoy the peace and quiet – the sound of solar panels at work is very soothing indeed. 2 X 240ah 12v Gel batteries connected in series. A Plasmatronics PL40 solar regulator with two shunt adapters allowing me to monitor both charge and discharge current very closely. The PL40 also holds 30 days of historical data to aid in analysing charge and usage patterns. Most lighting is fluorescent – some is LED – no incandescent lighting. 140amp 24volt alternator that charges the house batteries when the engine is running. A Xantrex 1500 watt Inverter charger. This charges the batteries at 30amps when there is 240volts available. It is a joy to have an electrical system in a motorhome that produces enough power for your day-to-day needs and reports the current status. Not having to worry about power or carrying large quantities of fuel for generators makes the whole motorhome experience far more enjoyable. This entry was posted on Sunday, August 2nd, 2009 at 1:50 pm	and is filed under Caravan, Motorhome, News, Power, Solar. You can follow any responses to this entry through the RSS 2.0 feed. You can leave a response, or trackback from your own site. I have 24v cranking in my recently acquired housebus, and currently 12v in the ‘house’, but low grade truck batteries which i’m looking to replace. Why is it important to have the same voltage in the house? It would mean changing a few things, but if going to outlay a lot on some deep cyle batteries, it could be a good time to make the change. Thanks. – Use the same alternator to charge either or both banks of battery. 24 volts is the best choice for any house system in large vehicle as the voltage drop problems are halfed when compared to 12v systems. This means you need half the cable size. 24v is also the only realistic solution if you want to run large load items (like a microwave) from an inverter. For example – our microwave is very small – it draws 65 amps when running (on the 24v side of the inverter). If we had a 12v house system this would be drawing 130amps on the 12v side of the inverter. Drawing 130a will require a very serious lump of cable and some very good quality connections. Also – solar regulators (like the PL series) are rated in amps (not watts) thus a PL40 will handle 40 amps of solar panels at either 24v OR 12v. This means it will handle 960 watts of solar at 24v but only 480 watts at 12v. The same is true of the load terminals of these regulators. Thanks – food for thought as I would need to change a few things, but now would be a good time. I am assuming that the 4 X 220aH batteries are 6v – this gives you a total capacity of 440aH of gel batteries at 12v. The question of size of alternator is not really related to how much power you consume – but more one of how quickly you want to be able to recharge the batteries when the engine is running. Gel batteries accept a greater charge than conventional flooded lead-acid cells, therefore a larger alternator will allow you to charge the battery bank faster. If you spend a few days camping and the batteries are becoming quite discharged, it is a big advantage to have a large capacity alternator that will replace that charge in a couple of hours as you drive to the next camp spot. In this case an alternator with a capacity of 70 – 120 Ah would be ideal. On the other hand, if you plan to stay at a single camp for a few weeks at a time, the money you could have spent upgrading your alternator would be better applied to additional solar panels. Running the vehicle engine while stationary just to charge the batteries, is very uneconomical. will the pl 40 tell me how full the batteries are with 1 shunt ??? you said that you have 2 shunts?? will the pl 40 see the ins and out of the amps??? and bus is now registered as m/h after neer 2 hours at rta doing paper work and them trying to get rta codes correct for converstion from bus to motor home. Hi ya, sounds like you are well on the way. The short answer to your question is yes, if correctly installed the PL40 will show total usage, total charge and state of battery (as a percentage). The only reason that I installed a second shunt was to give me more info when I was experimenting with the wind turbine. Just be sure you follow the diagram. I purchased a caravan with a solar system already installed. Two 64 W panels, 20A regulator and 2 12v 100ah batteries. Batteries connect to a 30A power box distributor that also plugs into a 240V which it converts to 12V and also charges batteries (240V runs aircon). I have just installed a further two 130W panels, 30A regulator and two 100ah batteries. Batteries are connected in parallel for a 12v system. I have not connected the two new panels yet as it basically a separate system. What I want to know is, can I connect the new system to the batteries in parallel with the old system without electrically damaging anything. I am worried about feed back from one system into the other, i.e from the new bigger system feeding back into the 20A regulator; are the regulators protected from feedback with one way diodes? or do I have to install the diode myself on the positive terminal to the 20A regulator or what; could you please advise on this and how to best connect these systems together. Much appreciated. While it is not the ideal way of doing things, there is no reason that you can not simply connect the two battery banks together in parallel. The two solar regulators will operate independently and should not cause any major issues – feedback will not be an issue. A much better way of doing this would be to use a single regulator (large enough to handle all panels) and have this control both the old and new panels. Have this regulator feed all four batteries connected in parallel. From a purest point of view, it is not considered good practise to connect old and new batteries together (they will have differing charge and discharge characteristics). Hello again and thanks for that, much appreciated. just one more thing, you said to use one regulator to handle all panels (I assume you mean old and new in parallel of course), I thought of that but because they are different sizes, 64w (max power 16.5v, 3.88A) old panels and 130w (max 16.9V, 7.68A) new one it would not be wise as specs in voltage not quite the same. You say its OK to do so? no feed back to smaller panels (as they are protected?). If so that’s great as it would save me a lot of headache. The new regulator is rated at 30A, total max of all panels would be 2 times 3.88 plus 2 times 7.68 totaling 23.12A, would that be ok as there is nearly 7A to spare? Oh, by the way, you are the first person to really help me and knows what he is talking about. One more question, can I attach an inverter from batteries to power aircon for short times using right size inverter of course? I would plug inverter into power socket outside of caravan where the mains plug into. I think aircon is 1 or 1.5 horsepower. 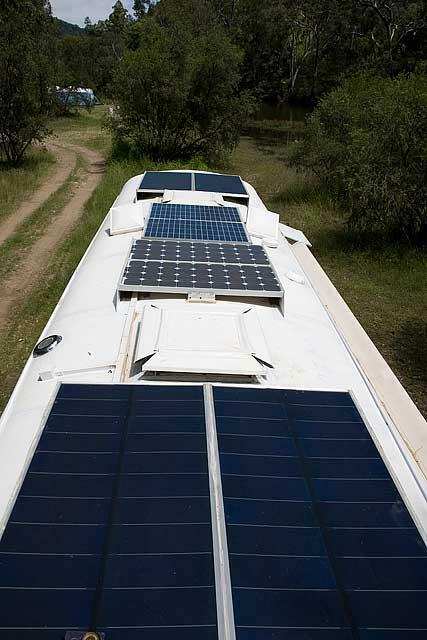 While it is not ideal to have panels of different types connected together, it is not really an issue (I have just about every type and brand on the roof of our motorhome). The 30amp regulator could be too small to handle all 4 panels (total = 388w = 32amps@12v (theoretical max) ) – in reality the output will always be less than this so the regulator should be ok (some regulators self protect (plasmatronics) and others melt on overload). @12v (not taking into consideration losses in the inverter) this is 94 amps. It will take many hours of midday full sun (with no other loads on the battery) to replace this energy from solar. You would probably require a 3000w inverter to get the aircon started. Recommendation – don’t do it. Hello again and much thanks; I agree also and will take your advice, generator is the way to go for aircon, take care and again thanks. Will let you know how I went with set up; hope for the best. In your setup you quote a Xantrex 1500 watt Inverter charger and refer to 240 volts. I can only find 120vac units with a requirement to use 2 in series with a Stacking Cable for 240vac. Can you please confirm this understanding is correct. Hi, the Xantrex inverter charger was in our bus when we purchased it. It has been a fantastic unit and has performed perfectly. It is however quite old and technology has moved on. I would suggest you look at the Phoenix range made by Victron and distributed in Australia by Bainbridge technologies. These have some great features, are very smart and seen to be very well made (in the Netherlands, not China). We have recently replaced our Xantrex with a 2000w Victron. Thanks Hobo that is great help. Hi Gavin,I have 3 x12 volt x 200w panels going to 2 x 230 ah batteries.could you please tell me what fuse to use between panels and the Plasmatronic PL40 solar controler and do I need to fuse both positive and negative wires. Under perfect conditions the panels can produce about 50A. The normal rule of thumb is to multiply this by 1.25%. A 60 or 70 amp fuse would do the job. As the fuse is there to protect the cable from overload – be sure that the cable can handle the current that the fuse will pass. I would fuse both the positive and the negative, although this is not strictly necessary it does provide additional protection against some faults. Firstly, great website!! You’ve made it easy enough foe even me to understand! What would you recommend we installed in the way of solar panels, regulators, batteries, chargers etc.? We were also considering wiring a separate 240v system, maybe with a battery charging system, for when we were in a powered camp site situation. What are your thoughts on this? Given the current low cost of solar, I generally recommend that new motorhomes and caravans be fitted with as many solar panels as will fit on the roof. Quality panels can be purchased for around $1/watt. I would look at the Victron range of inverters – say around 2000w. Batteries is a big cost and they have a short life – I would allow for lots, but fit only what you need at this stage. I expect lithium batteries to mature and become affordable in the not too distant future. I offer a full (paid) electrical design service for those building motorhomes wanting to get it right the first time. Please contact me if you are interested.